Small states are characterised by their very high degree of economic openness, export concentration and dependence on highly inelastic price and income demand for imports. These factors are associated with economic vulnerability, as they render a country highly exposed to the harmful effects on external shocks. In spite of such exposure, many small states register relatively high GDP per capita. The present article argues that such a seeming contradiction can be explained by the juxtaposition of economic vulnerability and economic resilience. The meaning of the word “vulnerability” originates from its Latin root vulnerare, meaning “to wound”. This etymology associates the word with exposure to damage or harm and with precariousness. When applied to the macro-economy, this term is generally used to refer to the country’s susceptibility or presidspostion to be harmed by external forces as a result of exposure to such forces. A number of vulnerability indices were constructed, including that proposed by the present author, and a common conclusion that emerges from these indices is that small states, particularly island ones, tend to be more inherently economically vulnerable than other groups of countries. The word “resilience” originates from its Latin roots resilire meaning to rise again. The present author defined economic resilience as the ability of an economy to withstand or bounce back from the negative effects of external shocks, and associated such ability with policy measures. Guided by this definition, the present author and his research collegues constructed a resilience index consisting of three components, namely (a) macroeconomic stability (b) prudent market efficiency and (c) good political and social goverance. 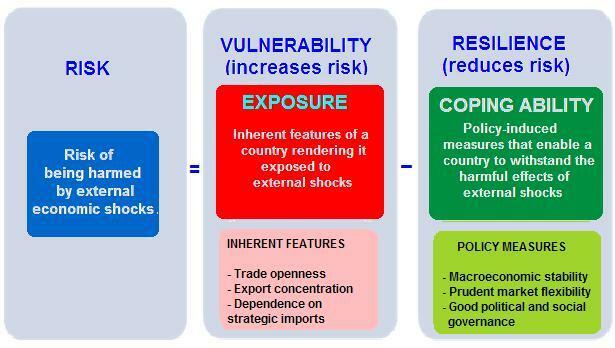 These variables are to a large extent influenced by policy, and are associated with the ability of an economy to absorb or counteract the harmful effects of external shocks. The interaction of vulnerability and resilience would indicate the overall risk of an economy being harmed by external shocks. Figure 1 shows that such risk of harm increases with economic vulnerability and decreases with economic resilience. The distinction between inherent and policy-induced resilience is important as this makes the argumentation policy relevant. If economic resilience is inherent (automatically triggered), in which sense it would refer very low level of inherent vulnerability, it would not be a subject of interest to policy, given that no intervention is needed. If, on the other hand, resilience is achieved as a result of consicous effort, by subjects likely to be harmed, then we can discuss the factors that lead to its achievement. This is a “nature vs nurture paradigm”, where nature refers to the degree of inherent exposure to harmful features (i.e. vulnerability) and nurture refers to the deliberate effort to counteract or recover from the effect of these harmful features (i.e. resilience). The present author utilised this framework to classify countries in four categories, as shown in Figure 2. The results indicate that (a) countries with high resilience and high vulnerability scores are mostly small states with relatively good economic, social and political governance (b) countries with low resilience and high vulnerability scores are mostly small states with weak economic, social and political governance (c) countries with low vulnerability and high resilience scores are mostly large developed countries with relatively good economic, social and politcal governance and (d) countries with relatively low vulnerability and low resilience scores include mostly large countries with relatively weak economic, social and political governance. This method of defining vulnerability in terms of inherent features and defining resilience in terms of policy-induced changes has a number of advantages. First, the vulnerability index refers to permanent (or quasi-permanent) features over which a country can practically exercise no control, and cannot therefore be attributed to inadequate policies. In other words, countries scoring highly on the index cannot be accused of self-inflicting vulnerability through misguided policy approaches. Second, the resilience index would refer to what a country can do to reduce (and possible exacerbate) its inherent vulnerability. 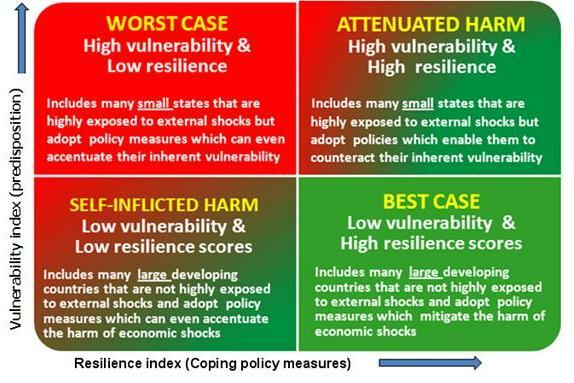 Third, the combination of the two indices would indicate the overall risk of being harmed by external shocks due to inherent vulnerability features counterbalanced to different extents by policy measures. The implications that can be derived from this framework are various. Firstly the fact that small states tend to be highly economically vurberable suggests that these states, more than other groups of countries, need to have a resilient economy, due to their high degree of exposure to external shocks. Another implication of the vulnerability/resilience framework is that small states can succeed economically in spite of their economic vulnerability if they adopt policies conducive to good economic, social, political and environmental governance. The main message of this article is that the fact that small states tend to be economically vulnerable should not be construed as an argument for complacency on the part of these states. There are a number of resilience-building policy options which could enable these states to minimise or withstand the negative effects of external economic shocks. This, in turn, entails that small states should assign major importance to resilience-building policies, and possibly embed such policies into their national plans and strategies. * This article draws Briguglio, L., Cordina, G., Farrugia, N., & Vella, S. (2009). “Economic vulnerability and resilience: Concepts and measurements”. Oxford Development Studies, Vol. 37(3): 229-247. Briguglio, L. (2014). “A Vulnerability and Resilience Framework for Small States, in Bynoe. D. (editor): Building the Resilience of Small States. London: Commonwealth Secreatiat.